The sea scallop is the largest of the scallops. They can be bought fresh or frozen. 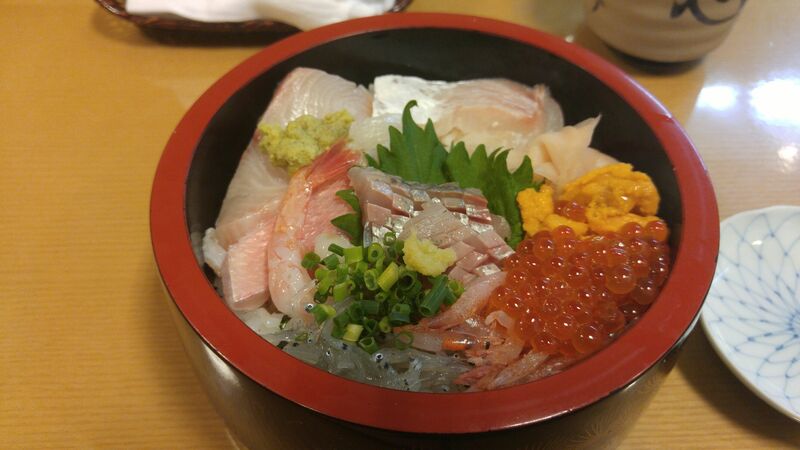 The raw meats are creamy white in color and sometimes slightly orange due to the food (algae) they consume. Scallops have a distinct, sweet odor when they are fresh.There are many ways to prepare scallops. Always take care not to overcook them; they toughen easily. As soon as they lose their translucence and turn opaque, they are done, Sea scallops may be broiled, kabobed, stir- fried, baked, or microwaved. There are many recipes for scallops. If you plan to put them in a sauce, it's best to cook the scallops and the sauce separately and then combine them; otherwise, water will cook out of the scallops and make your sauce runny. Nuke lotus root and carrot with 2 tbsp water in the microwave on high for 1 minute. Lay the scallops out on a board, pat dry with kitchen paper and then season one side with salt and pepper. Heat 1 tbsp oil over high heat in a frying pan large enough to hold the scallops. Scallops too close together in a pan will steam rather than pan-fry. When the oil is very hot, add the seasoned scallops, and cook for 2 – 3 minutes, until the underside turns golden brown, depending on the size of the scallops. Turn the scallops over and cook for 2 – 3 minutes more. Except for turning them over the one time, do not move the scallops or fidget with them while they cook. Tip the pan onto a plate lined with kitchen paper to absorb the excess oil. Heat 2 tbsp oil in a wok and fry the ginger until fragrant. Add in the mushrooms and garlic and saute/stir fry. Pour the tbsp of shaoxing wine to the side of the wok. Add in the lotus root, carrot and the sauce mixture and cook until sauce thickens. Add in the seared scallops and mix well. 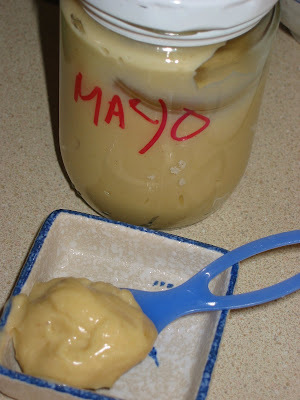 Homemade mayonnaise is one of the easiest things you can make and the taste is far superior to the stuff in the blue-topped jars. You can't buy the fresh lightness of a homemade batch of mayo, two minutes with a food processor, and you're done. Take that time and try it for yourself. Store bought variety lasts about six months in the refrigerator while homemade might last up to week. Combine egg yolk, lemon juice, vinegar, mustard, and 1/2 teaspoon salt in medium bowl. Using 1/4 teaspoon measure and whisking constantly, add 1/4 cup oil to yolk mixture, a few drops at a time, about 4 minutes. Gradually add remaining 1/2 cup oil in very slow thin stream, whisking constantly, until mayonnaise is thick, about 8 minutes (mayonnaise will be lighter in color). If, however, the sauce does break, you can start over -- or re-emulsify the sauce by adding the broken mixture, very slowly, into a new egg yolk. Place yolks, salt, mustard, sugar, pepper, and lemon juice in blender cup or work bowl of a food processor fitted with the metal chopping blade, and buzz 15 seconds (use low blender speed). Now, with motor running, slowly drizzle in 1/4 cup oil (use moderately high blender speed). As mixture begins to thicken, continue adding oil in a fine steady stream, alternating with hot water and 1 tsp vinegar. Stop motor and scrape mixture down from sides of blender cup or work bowl as needed. Coral Broccoli an interesting object with a shape and color reminding me of coral or outer worldly landscapes. It is also known as romanesco, minaret, romanesco cauliflower often called romanesco broccoli or calabrese romanesco especially in Italian recipes. The flavour is somewhere between broccoli and cauliflower, with a sweet, vegetal nuttiness - and it's bereft of the slightly bitter edge cauliflower can have. Add marinate to the chicken and marinate at least 1/2 hour. Nuke Coral Broccoli and carrot with 2 tbsp water in the microwave for 1 minute on high. In a wok or skillet, heat oil and when oil is shimmering, Add chicken to brown. 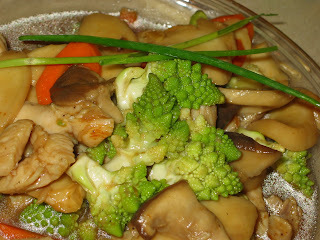 Add in garlic and ginger and saute before adding in the king oyster mushroom and coral broccoli. 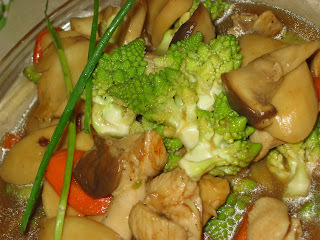 Add in the stock and let ingredients to cook until mushroom and chicken are cooked through. Add in sauce ingredients and let sauce thickens and comes back to the boil. Lastly add in the green onions. These appetizers are so christened from how their coating of glutinous rice turns to pearly grains when cooked. They are favorite mainstays in dimsum restaurants but can easily be made at home with a little bit of rolling. It contains no exotic ingredients and most of the work can be done in advance. What you end up with is a dish of delicately flavored steamed meatballs, each one covered with a pearly coating of glutinous rice. Soak glutinous rice in enough water to cover for 5 hours. Drain well and using paper towels, pat grains dry. Set aside. Reconstitute mushrooms in hot water for 40 minutes to 1 hour. Discard stems and chop the caps finely. In a bowl, combine all ingredients except the rice. Form around a teaspoonful of meat mixture into 1-inch diameter balls. Spread rice in a wide dish. Roll meat balls, one at a time, in the bed of rice grains, coating them completely with the grains. Arrange coated balls on a wax-lined sheet. At this stage they can be refrigerated or frozen for later use. Set up steamer with water. Bring around 1-inch of water into a boil. Arrange balls on a plate that will comfortably fit in steamer, or, alternatively, layer cabbage leaves on steamer rack and arrange pearl balls on top of leaves. Cover and steam until rice and meat are cooked, around 30 minutes. Serve with soy sauce or sauce of your choice. According to Infopidia - Popiah(also spelt Poh Piah), in Teochew for "thin pancake", is a thin paper-like crepe or pancake wrapper stuffed with a filling made of cooked vegetables and meats. 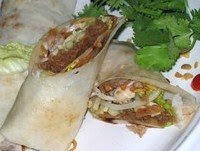 When deep fried, the crispy roll is known as a spring roll, but if left raw it is known as popiah. 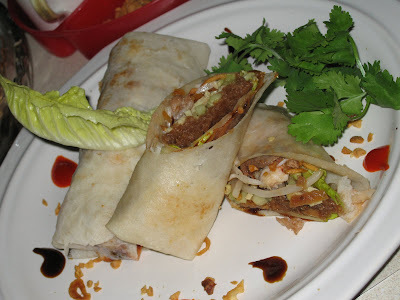 The popiah is of southeastern Chinese origins, originating in the Fujian province. It is derived from the spring roll which was eaten during spring when there was an abundance of vegetables. 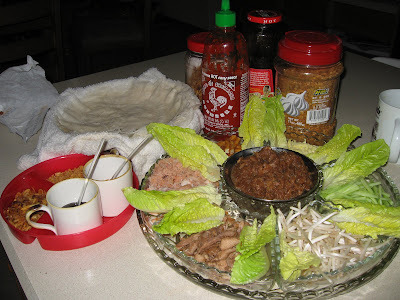 The Chinese diaspora has spawned variants of the roll throughout Asia, intermingling ingredients from the local culture resulting in such likes as the Nonya version of the popiah. 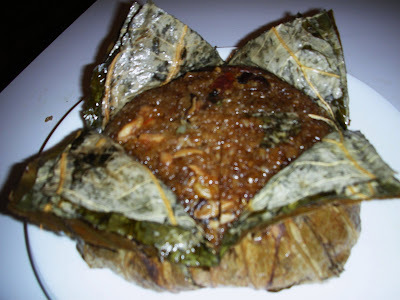 I like to prepare this dish for the Chinese New Year cos it is eaten at room temperature except fpr the main filling which i will keep warm in the slow cooker. Friends and relatives who drop by to 'pai lean' - meaning respecting the new year - can enjoy rolling up a few rolls of this savory. Heat oil in a kuali and lightly brown garlic. Add in pork belly and fry until fragrant, then add in shredded jicama . Pour in enough water and when it comes to a boil, add in the seasonings. Transfer to the slow cooker and let it cook until jicama is soft. Drain a cup of warm jicama and leave the rest in the slow cooker for future servings. Put a popiah skin skin on a plate. Place a piece of lettuce on the spread.and top with 1 heaped tbsp of jicama and then top with all the other garnishing ingredents. A little of each type of garnishing is sufficient. Wrap up tight like you would for the spring roll. 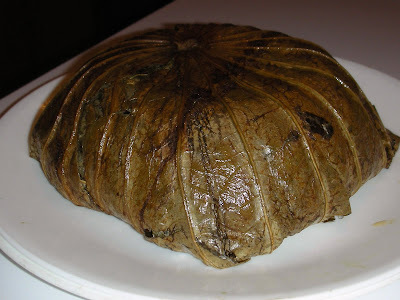 A popular dish to be served during the Chinese New Year and a must have order in the Dim Sum restaurants. This dish is sometimes called Loh Mai Kai , Hor Yip Fun or Chan Chu Kai. 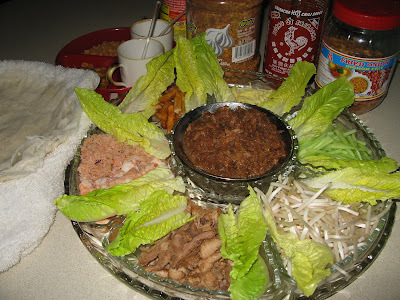 To me, Loh Mai Kai's ingredients are pretty similar but it is not wrapped up with lotus leaves as in Hor Yip Fun and the meats used are in slices or chunks. 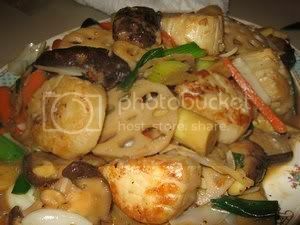 This recipe below is called Pearly cos the meats used are all diced into tiny or mini cubes, making them look like Pearls. 4 pieces chicken thighs, seasoned with five spice powder, sesame oil, Chinese wine, dark and light soya sauce, sugar and pepper. Soak two lotus leaves till soft (takes a few hours). Boil the lotus leaves in hot water. Wash the leaves under running water. Drain, dry and oil the leaves. Heat wok with a little oil, fry the lap yoke and lap cheong , remove and leave aside..
Fry dried prawns till fragrant then add garlic and shallots . Add in chicken, mushroom and all the ingredients including the rice. Continue to fry until the rice has been coated with oil. Put the lotus leave in a huge bowl, pour in the rice mixture. wrapped it up and cook in the pressure cooker. It may take very much longer if you steam in the conventional way but I with the pressure cooker, it takes only 10 minutes. Drain the rice and steam over high heat until cooked. Stir sugar, liquid glucose and coconut milk in a saucepan over a low fire until sugar dissolves. Strain mixture and return to the saucepan. Add in the steamed glutinous rice. Stir until mixture thickens, about 20 minutes. Pour into lightly greased trays. Press down with a small piece of banana leaf or the back of a spoon and a little thick coconut milk. 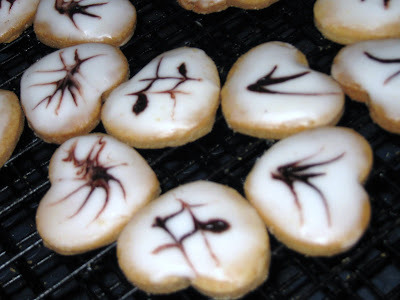 The name of these cookies is a mystery to me since the day it appeared on the table of Chinese New Year or Hari Raya spread. I think Mama Carrie must be an artist, as the cookie has some sort of fine art strokes. I really enjoyed putting the strokes on, it does not have to be very fancy, just a single stroke or two makes the cookie so elegant. Sieve custard powder, milk powder, salt and flour together. Using the food processor, cream butter and icing sugar. Add in vanilla essence and continue creaming. Add in sieved ingredients and beat till a soft dough is formed. Remove from food processor and leave to rest for 30 minutes. Roll to 1/4 inch thick and cut using cookie cutter of your choice. Arrange the cookies on a tray lined with greaseproof paper or silpat. Bake at preheated 350 f oven for 10 - 15 minutes. Let cookies stand for 5 minutes before removing to cool on the baking rack. When cool, spread the topping, using your finger, it does a better job. Dip a toothpick into chocolate emulco and sketch on top of the topping. We used to call them cornflake cookies as we often rolled them in lightly crushed cornflakes or oats cookies when rolled in oats . Either way they are delicious and must always be topped with glace cherry. Cream the butter with the sugar until very light and fluffy. Roll walnut sized pieces of the mixture into balls and toss in dessicated coconut. Cut each glace cherry into quarters, a quarter for each melting moment. 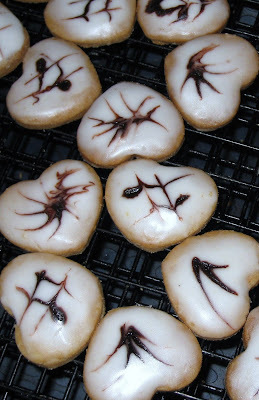 Place on silpat lined baking trays, flatten slightly and place a small piece of cherry on each cookie. Bake for 10-15 minutes until golden brown . The chinese new year celebration will not be the same if this 'bak kwa a.k.a. Long yoke is not served. Bake for 7 - 10 minutes. Meat should feel dry and will not break when pressed. Meat is dried and ready to be cut. Use a pair of scissor to cut into big pieces. Use a off-set spatula to loosen the base of cut meat and remove from baking tray. Stack them up and in this stage, wrap it in foil and it can be kept in the freezer. Meat can be grilled over a charcoal stove or like me, it is too cold outside for grilling, so i either use the indoor griddle or pan fry. Bak Kwa/Long Yoke are ready to enjoy. Pack in Greaseproof/parchment paper and then in an air-tight container and keep in fridge cos it will turn moldy if they are not grilled well. One of the classic snacks in Malaysia. There are many flavors but prawn is the most favorite of all. My mother-in-law made the best Fish Crackers and how i wished i had learned from here. Now it is too late, recipe and know how are buried with her. God bless her soul. Use kitchen towel to dry the prawns. Put prawn into food processor and process until it becomes a paste. Roll paste in 1 1/2 inch logs which weighed 8 ozs each log and place in a greased plate. Cover with a piece of foil which has been greased to prevent paste from sticking to it. In a pressure cooker, put in 1 inch of water and place a stand to raise the plate above the water. Put the covered plate in and pressurized for 30 minutes. Logs of prawn paste should be cooked through. Let them cool before wrapping in foil and leave in the freezer to harden, to fasilitate slicing. Use a sharp knife and cut into very thin slices. Put the slices in the food dehydrator and dry the slices. Friends in the tropics can sun dry the slices. Friends in Denver, you don't even need the dehydrator, just leave the slices on the cake rack and let it dry at room temp. Heat enough oil for deep-frying. when oil is hot - 350 f - drop a few pieces of dried crackers and watch them expand. Dish out as soon as they have expanded. Do not overbrown them. Use a spider ladle to aid removing crackers from hot oil.